On this Sunny Friday afternoon in January, I found myself craving a burger. I’m sure you laugh and think that goes through my head every day. However, this time was different. I’ve been on a post holiday “diet” and working out like a madman. This morning at the gym I noticed that I had lost 7 pounds. Feeling pretty good about my accomplishment, I decide to justify this craving with a reward burger. After much go between on the Burger Conquest Twitter whether to hit the Shake Shack or Bill’s Bar, it’s decided; Adam, the Meat God and I are going to Bill’s Bar. 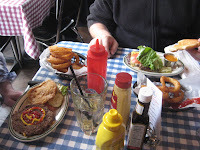 Now the last time that Bill’s Bar got Burger Conquested, was a very special event. We hosted The First Ever Burger Conquest Costume Burger Ball and it was a blast. Since then, I have been dying to go back to this B.R. 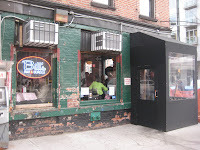 Guest restaurant in NYC’s meat packing district. With no delay, the Meat God ordered an Oreo shake, onion rings and a “Sunset and Vine” burger. “I knew what I was getting before I came here” he proclaimed. The pressure was on. 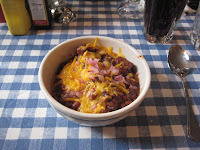 I started with an order of the Texas Brisket Chili; Brisket, Bacon, Beans and a lot of Spices, topped with Onions, Diced Cheddar, Sour Cream. Because I wanted to maintain some semblance of health, I ordered sans sour cream. (Go ahead laugh.) The chili was fantastic! The red onions and the sweetness of the barbecued brisket made for a really unique chili taste. It wasn’t very spicy but it certainly was robust with flavor. I would definitely recommend it to the curious. Be warned though, it’s a hearty portion. Get it to share. Curious to try something different, I also ordered the “Sunset and Vine,” which is a “Bill’s Classic” with Cheese topped with Lettuce and Special Sauce. Again, trying to make healthier decisions, I asked for it on a whole wheat bun. As the patties at Bill’s are thin and cooked smashed style, it doesn’t take too long for them to arrive. 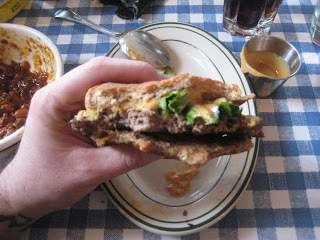 I took my first bite without the sauce just to confirm, that yes, Bill’s makes a fresh, delicious and flavorful burger. It’s not too greasy but it is a little juicy. The sauce however, is quite unique. I thought it had a smoky peanut butter taste but the server confirmed it was a BBQ / mayo based concoction. Whatever it is they put in it, they should bottle and sell it! I must say, the whole wheat bun was better than the white, not only in taste but also in strength. The bottom buns at Bill’s have a tendency to fall apart from all the toppings and the juice but the whole wheat held strong throughout the sandwich. I know the critics are tied and while some love Bill’s, there are some haters and to them I say “are you out of your freakin’ minds?!?? 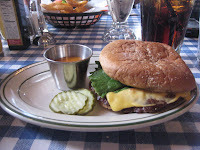 !” This being my 3rd burger at Bill’s, I can firmly tell you, this place is fantastic. So you know what, go ahead and hate it. That just means more Bill’s for me and Bronar! 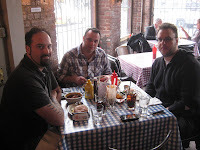 This entry was posted in Burgers, Gourmet Burgers, Hamburgers, New York and tagged B.R. 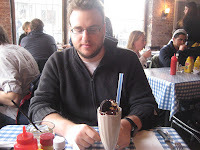 Guest restaurant, bar, best burger, best burgers in nyc, bill's bar, burger blog, burger club, burger conquest, cheese, ciancio, david, french fries, gourmet burger, great burger, hamburger, nyc, restaurant, rev, review. Bookmark the permalink. i've been to bill's maybe a dozen times at this point and it's always the same order- oreo shake, sunset & vine and onion rings and it always will be. i love the shake shack too, but a burger this good, 5 blocks from my house?? come on! Those onion rings look really good.